The landscape surrounding Borthwick Castle in the winter months is a truly picturesque sight, with the crisp blue skies and glittering frost adding to the Castle’s magical setting at this time of year. 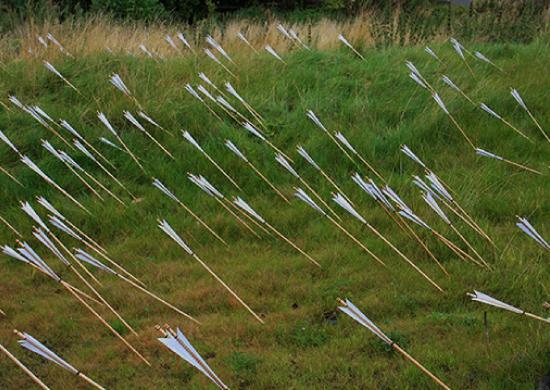 But in the past few months you could catch a glimpse of another and most unexpected vision – a mysterious scattering of hundreds of arrows across Borthwick’s grassy banks. In this post we solve the mystery of these enigmatic arrows – courtesy of Bradley Borthwick, Assistant Professor of Art at Colby College, Maine USA, and his three-year long project Flodden: The Mote of Locherwart. Earlier this year Bradley and his team came to the Castle to loosen these arrows as part of a unique and highly personal art installation and he was able to explain more. 1. What is your personal connection to Scotland? My connection to Scotland begins with my ancestral name and place, Borthwick. Through the close relationship I held with my grandfather, William David Borthwick, the significance of my familial history influenced my strong connection with Scotland and even led me to study abroad at Heriot Watt University in Edinburgh. 2. Why did you design your project to be focused at Borthwick Castle? Borthwick Castle exists as a unique remnant and a signifier of a different time and a character of place. Each flight of an arrow loosened from an English longbow presents an arc that momentarily folds through the space of this remnant place. 3. Where did the inspiration for Flodden: The Mote of Locherwart come from? Personally, my inspiration for this project was found while I was reflecting upon the loss of my grandfather and the enthusiasm he shared for the broad context of clan history. Historically, both ‘Flodden’ and ‘Locherwart’ are place names that site Borthwick clan events, where the former involves significant loss at the Battle of Flodden, 1513, and the latter identifies with the bucolic setting of Borthwick. The title ‘Flodden: The Mote of Locherwart’ presents extremities - the distress found while away from home and the comfort of home - that share the label within a metaphor of peripherals that apply to circumstances in life. 4. How long did it take you to design this project? The project planning took three years – a slow, yet detailed process. 5. Have you undertaken anything similar to this project before? I have created one other short film, ‘Not All Borthwicks Were Noblemen’, 2011. This film project involved my earlier attempts at making the English longbow and arrows to historic specification, all being loosened on the Colorado Plateau. At the time, this film reflects upon where I had landed in life. 6. Did you receive funding for the project? I received a Canada Council for the Arts Project Grant and a Colby College Humanities Division Research Grant to fund this project. 7. 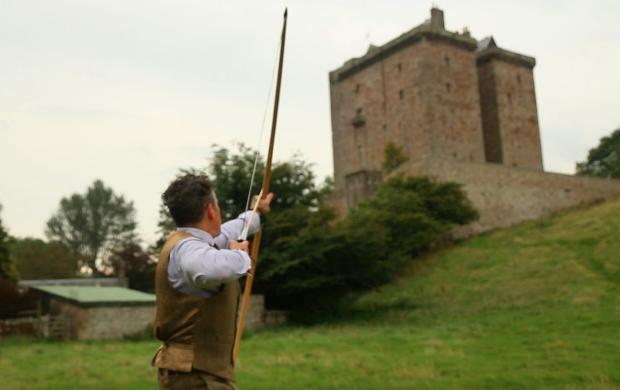 Where did you source the arrows and how many are showcased at Borthwick Castle? 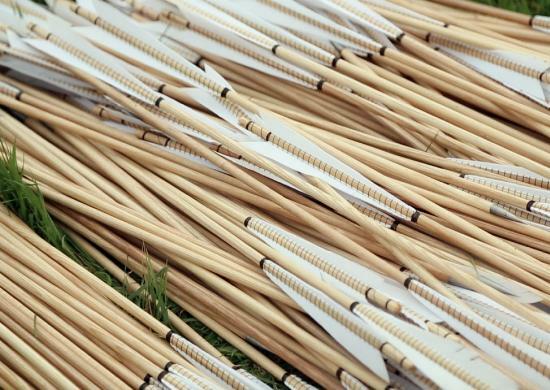 These arrows are hand made by fletchers from Longbow Shop Ltd. in Birkenhead, England. These gentlemen produced thirty dozen arrows for this project. 8. What did the installation process involve? 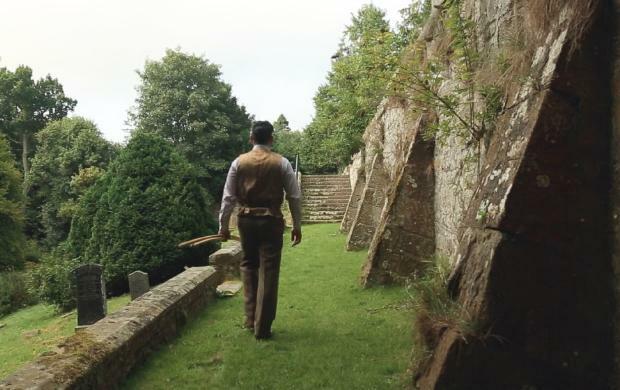 Once I arrived at Borthwick Castle, the installation process began with one full day of walking through landscapes - the adjacent fields, the wooded ravines, the church yard, and the castle grounds. These spaces provided for a sequence in filming and for finding the station from which to loosen arrows. The loosening of thirty dozen arrows occurred in the early evening of day two. 9. Who was the project videographer? Have you previously worked together? The videographer on this project is Xiaoxiao Yan whom is based in Montreal, Quebec. This project marks the first of two that we will create together. We co-create at a distance when not on site with the actual filming. 10. What was the biggest challenge you faced in documenting Flodden: The Mote of Locherwart? A significant challenge in documenting this project was in finding consistent placement of arrows once loosened from the longbow. Arrow flight is very fast and difficult to capture within the technical capacity of the camera - consistency from over one hundred meters away after several hours became my challenge. 11. When will you be returning to Scotland to complete the project? I plan to return to Borthwick Castle in six months to collect the arrows. These warped arrows are fundamental to the gallery exhibition of the film - I will include these artefacts alongside the film projection within the gallery space. 12. What do you hope viewers will take away from the project when it is exhibited? I hope the viewer may find a contemplative moment and a pause from the noise of their day. 13. Will you consider undertaking future projects within Scotland? Absolutely - Scotland remains intact to my own sense of self and will continue to inspire my creative process and the direction of my studio practice. To learn more about Bradley and his work, please vist his website.